This extract comes from C W Leadbeater’s “An Occult View of the War” which was written during and about World War One. It contains some strong anti-German sentiment. 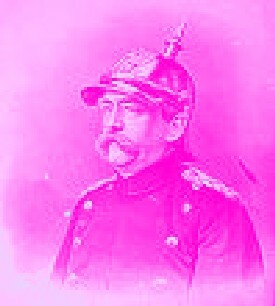 After a tirade against the Germans, he is speaks of Otto Von Bismarck 1815 - 98, the German Chancellor from 1862 – 90, denouncing him as an apostle of evil and outlining a claim made by H P Blavatsky that he was an occultist and used occult practice to assist a Prussian Victory against France in the Franco – Prussian War of 1870. “Because of their intense pride, because of the teaching of brutality and of force, (of blood and iron instead of the law of love and because of the low level of general morality which is the direct consequence of such teaching, they have laid themselves open to this dreadful obsession, and some of the great Lords of the Dark Face have again taken their place among them. This war between Prussia and France began as the result of a diplomatic incident between King William of Prussia and a French government minister generated and hyped up by Bismarck during a dispute over a German candidate for the Spanish throne. Troops from other parts of the then existing German Confederation were involved but Prussia provided most of the troops and Prussian Generals were in overall command. The French armies were defeated within a couple of months but Paris held out for five months. French Emperor Napoleon III was deposed and replaced by the 3rd Republic. During the siege of Paris, the Germans proclaimed the new German Empire (Second Reich) at the Palace of Versailles. As part of the peace settlement France lost the Alsace and Lorraine provinces.